The display at the entrance to the Matisse: Radical Invention 1913-1917 exhibit at the The Museum of Modern Art on July 13, 2010 in New York City. Imagine you had X-ray vision and could peer beneath the layers of paint on a canvas to discover the painstaking process of creating a masterpiece. That's essentially what curators have done in an exhibition on Henri Matisse that opens Sunday at the Museum of Modern Art after making its debut last March at The Art Institute of Chicago. The show explores the years 1913-1917, a pivotal period in Matisse's artistic development when he temporarily abandoned his interest in decorative patterning and brilliant color for darker, more abstract compositions. The curators propose that these geometrically composed paintings, dominated by blacks and grays, were at least partly a response to World War I, which erupted in Europe in 1914, a year after Matisse returned to Paris from Morocco. The works also represent his attempt to absorb and respond to the challenge of cubism, then the dominant trend in the avant-garde art world, with its radical reinvention of form and space. The inescapable message of this dazzling exhibition is that making great art is hard work, as is the elaborate process of putting together a great art show. The exhibition is the result of a five-year collaboration between John Elderfield, MoMA's chief curator emeritus of painting and sculpture, and Stephanie D'Alessandro, a curator of modern art at the Art Institute. Using a variety of new technologies to probe beneath the surface of Matisse's artwork, the curators demonstrate how the artist was constantly reworking and revising his ideas, scraping, scratching and repainting his canvases, adding to and subtracting from his sculptures. 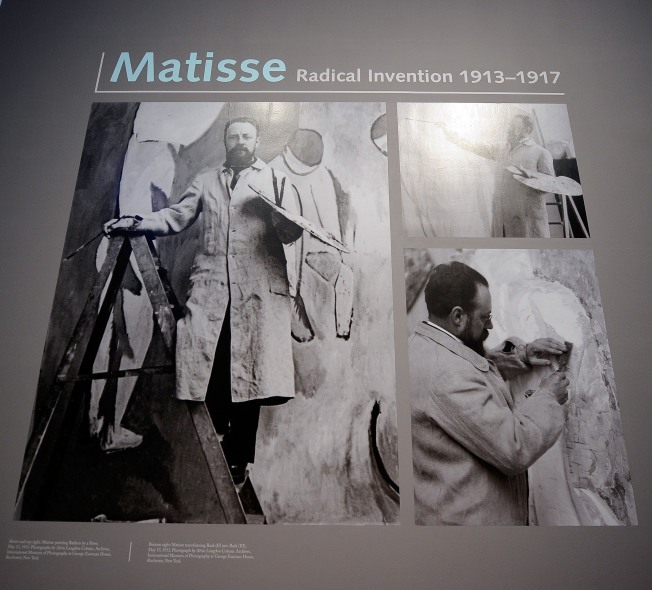 It was during this period, they contend, that Matisse became increasingly preoccupied with letting the public see the process of making art, what he called "the methods of modern construction." He no longer sought to hide the grids and lines that artists use to organize their paintings. And so in the painting "Portrait of Yvonne Landsberg," from 1914, we see winglike incisions above her shoulders, as though he were intent on showing us his lines of construction. The centerpiece of the show is the oil painting "Bathers by a River," on loan from the Art Institute. Using high-tech analysis, the curators have assembled a digital slide show that reveals at least six versions of the painting from 1909 to 1917. Matisse had borrowed the theme from a bright, decorative watercolor of five figures in a lush landscape from 1909. As he transformed the subject into oil on canvas, the bright colors grew darker, and the lithe bodies became more abstract, geometric and monumental. When the Chicago museum acquired the painting in 1953, Matisse said in a letter it was one of the five most pivotal works in his career. Another high-tech presentation explores the evolution of four relief sculptures titled "Back." Through the magic of technology, we see how the figure of a woman, seen from the rear, evolved over 23 years from a curvy, fleshy figure into an abstract, geometric monolith. Matisse's process of continually reworking his subjects and materials illuminates his stature as one the greatest artists of the 20th century. Perhaps nothing illustrates his artistic evolution better than two still lifes painted 22 years apart. The first, "La desserte (after Jan Davidsz. de Heem)," was copied by a young Matisse in 1893 from an Old Master painting in the Louvre. It is a conventional, realistic reproduction, rendered in a dark palette of browns and creams. In 1915, he painted it again. The later version is organized by a geometric grid and enlivened by radically simplified shapes and flat expanses of brilliant color. It almost dances off the wall. How did Matisse explain the remade composition? He worked with "the methods of modern construction," he said, "adding everything I've seen since." The show runs through Oct. 11.